City workers Barry DeDomenico (left) and Kenneth Pringle feed the truck with large recycling containers from a multiunit building in Portland's Old Port in this BDN file photo. 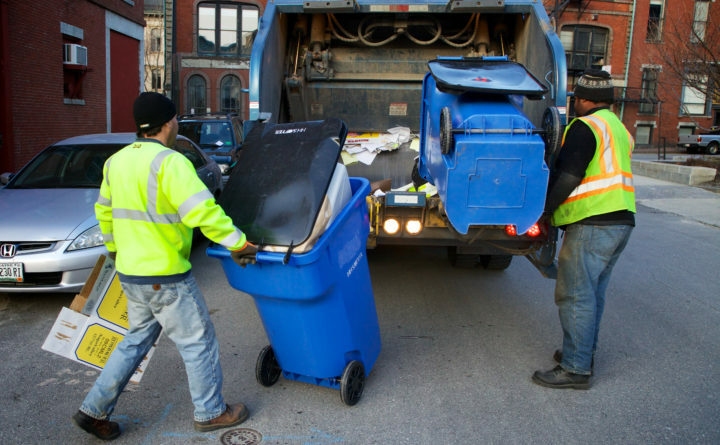 The city of Portland is handing out more warnings to residents leaving out “contaminated” recycling bins for curbside pickup, a city spokeswoman told The Forecaster. Jessica Grondin, spokeswoman for the city, told the newspaper that Portland doled out more than 200 warnings the previous week telling residents to correct the behavior or face a possible $100 fine. The orange warning stickers are put on the 64- or 96-gallon blue recycling bins when pickup workers discover discarded material that’s not recyclable in the city’s system, such as plastic bags, polystyrene or household food waste, The Forecaster reported.